You want to protect your goods during transportation? 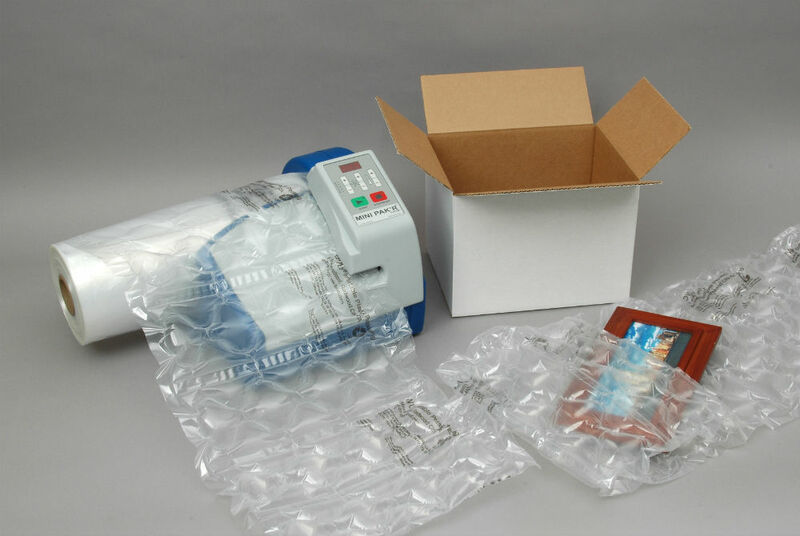 Mini pak’r is a small, easy to use system that allows you to produce air cushions on demand. You can choose from 5 different types of air cushions, for any kind of protection you need. Easy to use: plug in the machine, load the film and it is ready to go. The machine uses an internal air source, no compressed air is needed. Virtually maintenance free and 12 months warranty. Latest technology : uses RFID (Radio Frequency Identification) technology to automatically select the correct settings for ease of use. Versatile : at a speed of 7,5 mtr/minute the machine makes 5 different types of air cushions that fit a variety of packaging applications from block and brace to void fill. Space saving : machine is compact (LxWxH=36x33x28cm), weighs only 6 kg, and fits almost anywhere. Eliminates the need for storing traditional packaging materials such as bubble wrap. Use the optional Wall Mount to position it above the packing area, saving even more space.